The 13 Gallon TouchTop™ Wastebasket has a stylish design and polished finish that will add a decorative touch to the home. The spacious capacity of this wastebasket makes it the ideal size for kitchen use. The long side of the rectangular base fits against the wall saving space. TouchTop™ lid opens with a touch then shuts securely to keep contents concealed. 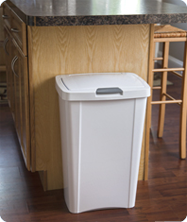 The TouchTop Wastebasket fits standard sized 13 gallon trash liner, or can be used to collect recyclable material. 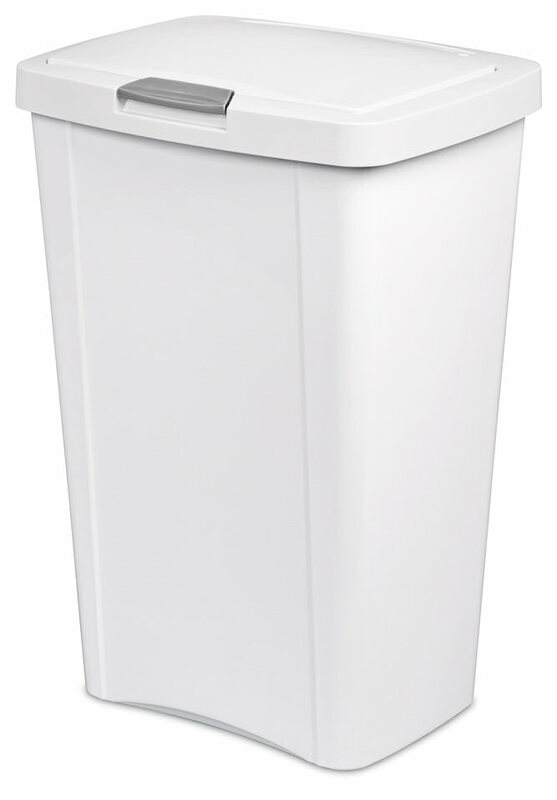 This Wastebasket is ideal for all areas of the home including Kitchen, garage, basement or office. The overall dimensions of this item are 16 3/8" L x 12 5/8" W x 24 3/4" H.
Overall Assembled Size: 16 3/8" x 12 5/8" x 24 3/4"
Ideal for use in the kitchen, next to cabinets or appliances. 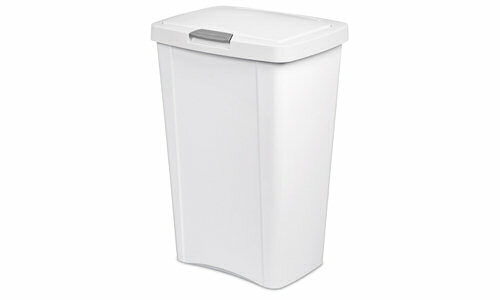 13 Gallon TouchTop Wastebasket is rated 3.0 out of 5 by 60. Rated 1 out of 5 by Wyopark52 from Poor Quality Grey latch broke shortly after purchase. Turns out I should have researched trashcans before my purchase as the latch breaking on this can is a very common complaint. Sterilite - Stop making this trashcan or improve your quality. Rated 5 out of 5 by IamChellester from 13 Gallon TouchTop Wastebasket I am very happy with my purchase of the 13 Gallon TouchTop Wastebasket. It makes it so much easier to just touch the buttons to open the top & throw out your trash. This is perfect sized for my kitchen, fitting very easily under the desk, or in the pantry as well. I love how the glad trash bags fit perfectly in here, and it keeps the foul smelling odors at bay by having the touch to close feature. I would indeed recommend. Rated 5 out of 5 by Joseph from Good Trashcan and Great Customer Service I have a 1045 White 13 Gallon Trashcan which is great as the Touch top worked good. However after some months the Plastic Touch Handle broke. I sent an email to Sterilite and they sent me two replacement handles. This saved me the expense of buying a new trashcan. Rated 5 out of 5 by ConcreteCowboy from Great Trashcan & Perfect Size! Even Better Customer Service! I have a 1045 Black 13 Gallon Kitchen Trashcan that we had for about 6 Months. It fits Perfect under a Table & beside a Pantry & the Black Color matches well too, whereas no others would fit and Still be able to use without moving every time to use it. The Only problem is that 1 of the Thin Plastic Touch Button/Handle hinges Broke & those Parts are Hard to find. But, Sterilite has Awesome Customer Service and Thankfully those parts are Replaceable and after I wrote to Sterilite explaining my Issue & I Offered to Pay for a New Button but, she is sending me Extra ones at No Charge! I'm Glad (No Pun Intended for "Glad" Trash Bags LOL!) I did as we searched for Others but none in Stock at Stores would fit just right... I could've Bought another Whole Can & just Replaced the Button but, didn't find any that were in Good enough condition or any New ones in Stock that would fit this Model. I Hope they Start making More of these Models and get them More Available in Stores. Thnx! Rated 4 out of 5 by Katpop43 from This Waste Basket is a Useful Size for Many Areas We have two of these waste baskets. One is in the kitchen, the other in a storage area. They are a useful size for almost anywhere, as they don't have to be emptied often unless it is necessary due to contents. The only problem we had is that the latches on these broke very easily and since the stores do not carry only tops, I wrote to Sterilite. They were very helpful and told me that latches ARE a replaceable item! They were kind enough to send me replacements for both baskets and these new latches seem to be much sturdier and are working out well. Thank you, Sterilite! (The only reason I gave 4's on Durability & Quality was because of the latches.) Problem solved! Rated 5 out of 5 by Brenda from Excellent customer service This is a good looking piece that retains its shine after 3 years and holds up to regular use . Its weak spot is the springs that move the lid up. We have had two of these bins over 6 years and each time the springs gave out. I hate to throw away stuff that is still in prime condition. This time I wrote to customer service and they immediately sent replacement springs and a latch although that has not broken. (I hear others say this can wear out). I love to give my business to such a responsive company. Thank you!